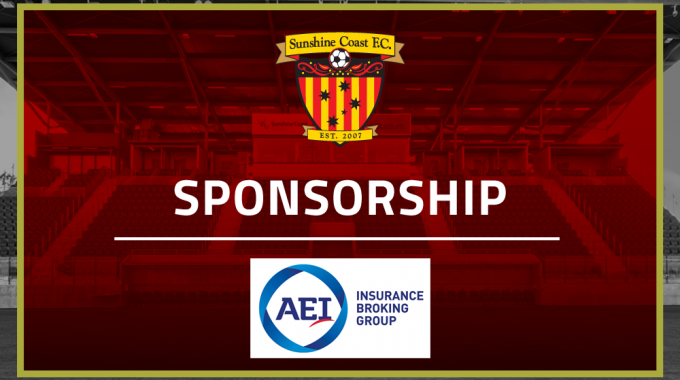 Sunshine Coast FC is pleased to announce the return of AEI Insurance Broking as a sponsor for the upcoming 2019/20 seasons. Following two successful years with the club, AEI has chosen to continue supporting young athletes and football in Queensland and the Sunshine Coast. AEI are a specialist commercial insurance broker and the reputable partner of choice for clients ranging from a sole trader or small professional firm, to manufacturers with turnover in excess of $100m. Working with newly formed enterprises to publicly listed companies, their experience crosses many industries including Manufacturing, Engineering, Retail, Professional Services, Construction, Importers/Exporters and Transport. AEI Insurance Broking Director Michael Donaldson looks forward to seeing what the coming two years brings for the club and player development. “We are delighted to continue our association with the Sunshine Coast FC as we see it as a leading club which provides pathways for up and coming players to strive for the next level, while also providing opportunities for the many members to compete each week,” he said. AEI is committed to supporting the continued development of players who are aiming to reach their potential and they wish all players, officials and supporters all the best for season 2019.